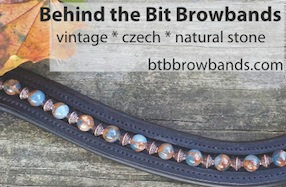 I made my second browband -- I followed the same instructions but ditched the hemostat in favor of needle-nosed pliers. MUCH easier, though I still stabbed my thumb and thigh repeatedly. I looked a long time for this color combo as these are TPO's colors (teal and purple).